First, either a male or a female may inherit, and it is just like human property ownership and not even remotely like the power struggles that most naturalists seem to think it is. To illustrate, when Maggie and Vicky first married, they combined territories. Maggie had a small territory that was originally a small ‘batchelor pad’ carved off from his adopted dad Fatty’s lands. 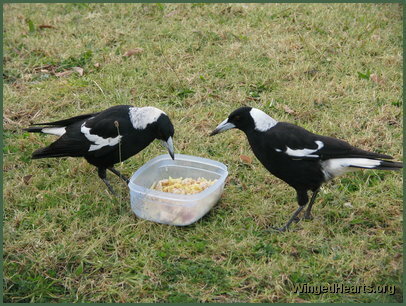 (Yes, magpies can and do adopt orphans!) Vicky, on the other hand, brought a large territory that came from her family who live deep in the bush and had no previous contact with humans. By a series of trades, Vicky’s inheritance was relocated next to Maggie’s small inheritance and the two territories were combined. The bulk of the territory, remember, was Vicky’s inheritance so, when Maggie died, the territory remained in Vicky’s possession. 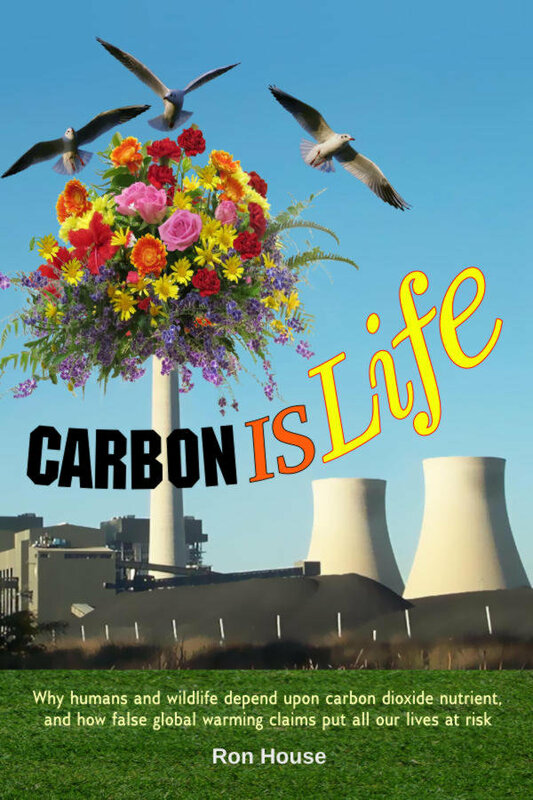 Naturalists will tell you it’s a power struggle. Well here was Vicky, a relatively small bird with a droopy wing, with two adult children Mindy and Monty. Over the entire territorial negotiating season, not a single attempt was made by any other magpie group to capture the territory by force. But a string of suitors came, each in turn staying on the outskirts for a few days or weeks, showing off their best features and trying for Vicky’s affection, until finally Bertie, a very large and powerful bird from a long way away, won her heart and became her new mate. Bertie is the supreme male magpie in our district. 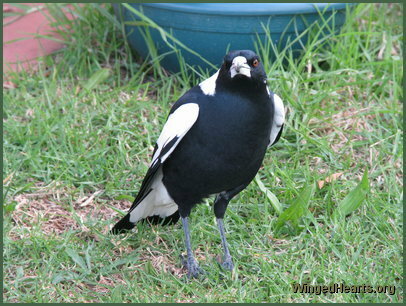 He completely dominates our other magpie dad Billy, he is a fearless defender and scrapper when other birds carelessly try to squat in his territory. But see him when small, weak flier Vicky is around! He pulls in his head and makes the soft ‘cluck, cluck’ sound that means submission, he lets her eat first, he lets her swipe food from under his nose! There is no mistaking who owns the territory! Magpies can bequeath their lands, but not to just anyone. Essentially, the current occupier is the representative of their family, and although they can pick their successor, they must pick one from within the family, perhaps a brother or sister or a cousin. It cannot be bequeathed to a husband or wife. This is why some people have observed a quite different outcome when one magpie in a marriage dies: The other is chased off by birds who seem, to us, to be intruders from outside the area. But in reality, the one who died in that case would have been the family owner, and the remaining bird thus has no claim on the land. Other birds from the extended family of the bird who died will then come in and tell the widowed bird that it is time to leave. The other magpie death that helped us understand these rules was that of Fatty, Maggie’s adopted dad. Fatty and his wife Molly were both very old birds by this time, but Fatty did not die of old age. He badly injured a leg and was unable to recover. At that time Maggie’s family consisted of himself and Vicky and four kids, including two adult girls Rinky and Rosie. Fatty’s family in the adjacent territory contained Fatty, Molly, and two adult kids Bunty (a very large, soft-hearted male) and Kimbie (our ‘dag princess’: tiny, untidy, and extremely noisy). Anyway, when Fatty was injured he went into hiding. We eventually found him in our yard in Maggie’s part of our garden. By choosing to die in Maggie’s area, he chose his adopted son as his inheritor. Now across the way was his younger, biological son, Billy, but Billy was not allowed to take his father’s lands. Instead, the day after Fatty died, Maggie’s whole family took over Fatty’s land, stationing themselves at regular intervals one per tree. Then they sang a loud song for all the other birds to know. Molly disappeared down the hill into her daughter Tammie’s territory. Then Kimbie brought us a male bird whom we had never seen before and never saw again, but he was presented to us, he strutted before us, sang a few bars, and generally introduced himself, then he flew away. We took this as Kimbie telling us which bird she would mate with when she was old enough. Lastly, Maggie’s family harangued Bunty until he got the idea he was not to remain. He too flew down to Tammie’s land and left the district (although he later called by from time to time to show us he was doing fine). Suddenly, after a few days, a new arrangement had taken place: Molly was back with daughter Kimbie and with Maggie’s daughter Rinky, who had changed groups. Maggie, having inherited this territory from Fatty, was allowed to go anywhere in his own territory and in Molly’s territory. This situation persisted until, a year later, Rinky injured herself and was unable to fly for some weeks. Meanwhile Molly, now extremely old, died in our neighbour’s yard. Billy, seeing the weakened state of the group, decided to make his own pitch for his dad’s lands, and eventually succeeded, which is why Billy and Polly occupy the land now. Kimbie and Rinky left the area. (We later found them safe and well in Allora, thirty or so kilometers away,so all was well with them.) 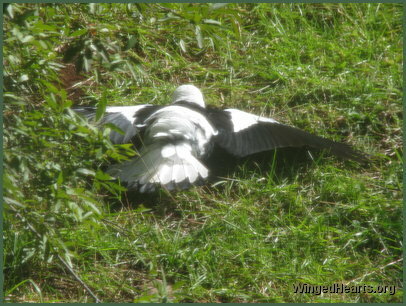 Maggie ceased going into Fatty’s old land after that, but he was always Billy’s ‘superior’, something like a landlord, and when magpie counsels were held, Billy would never be invited and would stand on the ground looking forlorn while the other magpies of the area held noisy singing discussions in the trees. Only when Maggie himself died, did Billy take full ownership of the territory and become a full equal of the other magpie landowners (because the territory could not go to Vicky, as it had to go back into Fatty’s extended family). 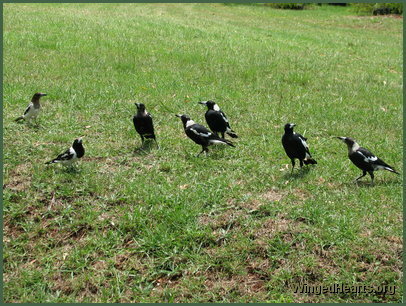 magpies remember the original source family of a territory, and a family member can assert a claim for a territory that has lost its owner, even if the claimant is not the direct relation of the deceased owner. Some kind of ‘strength of claim’ principle is involved in settling such claims. What, then, is happening during the time each year preceding the breeding season when territories seem to us humans to be in flux? The standard story told by naturalists is that it is another ‘nature is red in tooth and claw’ carry-on, a lawless brawl with the stronger bird the winner. If so, how did small weak bereaved Vicky not even receive a challenge for her ownership of her land? All this is what we have observed with our country magpies. But when humans unthinkingly knock over key breeding trees and concrete over a prime worm-finding ground, and birds have to find new places or die, is it any wonder that violence breaks out and the rules are forgotten? Isn’t that what we humans do too? We ignore their real natures as intelligent, loving creatures, we treat them like unthinking brutes, and then when they do as we would do in the circumstances, we take it as confirmation of our own prejudices. Not very smart for the uber-species! Anyway, this is my understanding of magpie inheritance. I believe these rules can be tested by taking note of which bird is dominant in the magpie partnerships near you (it won’t always be the male) and watching developments as the generations change. This is a complex and fully developed legal system, and there is probably a lot more to it than we have been able to understand so far. Permalink Submitted by Anonymous (not verified) on 16 April, 2011 - 17:49. Permalink Submitted by Ron on 24 September, 2011 - 15:17. All we can do is tell what we each have learned. It all adds up.